You expect perfection. We will provide nothing less. 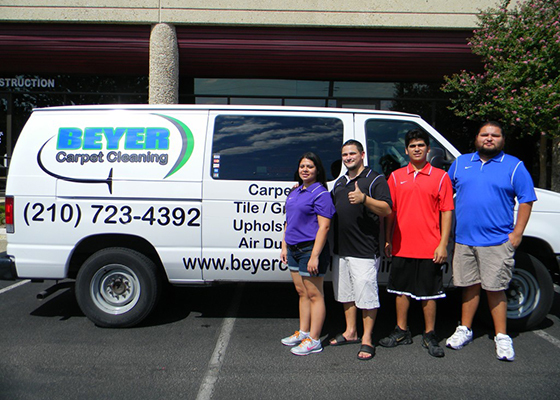 Beyer Carpet Cleaning San Antonio takes cleaning to a whole new level. With a dedication to customer service and a passion for spotless homes, San Antonio has never seen this kind of clean! Always keeping our customer’s priorities at the forefront of our business, we lead the industry in finding the most efficient and cost-effective products and equipment. We never sacrifice quality for affordability so we can assure you that you’ll receive a premium carpet cleaning, tile cleaning or upholstery cleaning for the best price when you choose Beyer Carpet Cleaning. We always treat your home like it is our own by creating an environment that will look and feel better. Every clean is a deep clean for us, meaning that we not only eliminate the dirt, dust, and odors that are in plain sight, but our products and equipment reach deep down to eliminate hidden dirt and odors at their source. You will never doubt if we did our job correctly. It’s the difference you can feel! Offering top of the line services in professional truck mounted carpet cleaning, upholstery cleaning, tile and grout cleaning, stain removal, and pet treatments, we are as versatile as we are experienced, and we perform every task with equal excellence. Contact us today for a free estimate to see why our clients love us. They’ve made the switch to a cleaner life—will you?